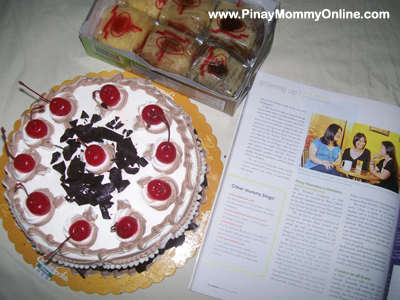 Last week, I was trying to look for the October 2008 Issue of Working Mom Magazine but to no avail. And just last night I have finally gotten my very own copy (in the flesh este paper!). Since I considered it as an accomplishment, I treated my kiddos and my parents as a way of saying thank you to them for being so supportive. We went to ChowKing (again ^_^) but this time at LimKetKai Mall. We ate our favorite SET C (chopsuey, fried chicken, pancit) and drank iced tea. I know some of you might notice that we have been eating at ChowKing lately. To be honest, we just eat there because we like it not because I am compensated to post about it. LOL!! And before going home, we drove by Goldilocks to by a Choco Cherry Cake. To be honest, I just bought it because I wanted to eat cake weeks ago. But when we arrive at home, I just took a picture of it but didn’t felt like eating. Anyway, that is how I celebrated my weekend. So, how did you celebrate yours? Way to go Mommy R! Congrats!